Even if you plan to breastfeed, it’s a good idea to have a container of formula on hand—or at least to formulate a plan of which brand to buy if you need it. You’ll find many choices of formula, but one to strongly consider is Earth’s Best Organic Infant Formula. It contains everything your baby needs: high quality protein, carbohydrates, vitamins, minerals, and essential fatty acids DHA and ARA. The DHA and ARA are naturally found in breast milk, and they’re critical for your baby’s brain and eye development. But perhaps more important, it doesn’t contain things your baby doesn’t need. Because it’s USDA organic, it contains no growth hormones, antibiotics, steroids, or potentially harmful pesticides or herbicides. 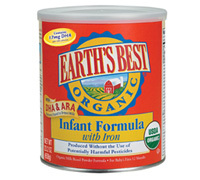 Earth’s Best also offers a special “sensitivity” formula that’s formulated with an easy-to-digest blend of carbohydrates that are gentle on babies’ tummies and they also have a soy-based formula. You can buy Earth’s Best Organic Infant Formula in grocery stores, baby supply stores and online for around $25 for a 23-ounce can. Their website offers a handy tool to calculate how much formula your baby needs. Visit it at: http://www.earthsbest.com/resources/formula-calculator. Note: We received sample(s) of Earth’s Best Organic Infant Formula in exchange for our honest opinions. Regardless, we only recommend products or services we use personally and believe will be good for our readers.